Snow Plowing Services Provided By Green Acres Lawn & Landscape. We plow and remove snow from driveways, parking lots, and sidewalks. During the cold winter months dealing with snow and ice is an important part of operating any commercial property or large residential development in Kansas City. Parking areas, sidewalks, walkways, wheelchair ramps, and entryways need to be clear of snow and ice to maintain a safe environment and prevent slip and fall injuries and even potential lawsuits. Green Acres Lawn & Landscape is a licensed and insured Kansas City landscaping company that specializes in snow plowing, snow removal, and ice control services for both commercial and residential clients. 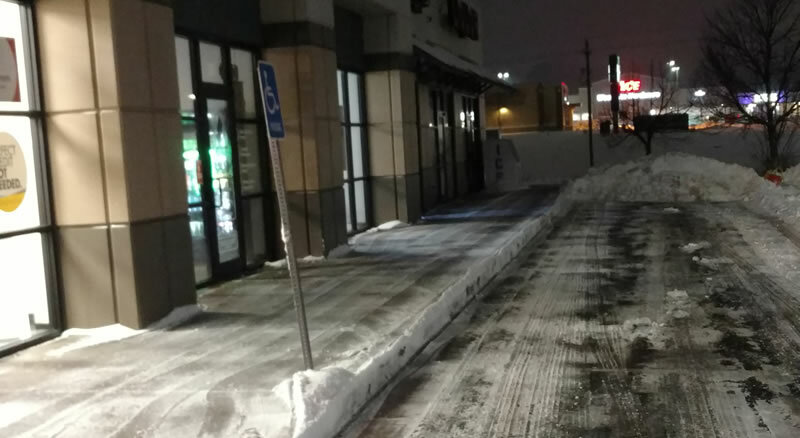 Whether you need your driveway plowed and walkways shoveled or you need the parking lot for your business plowed and the piled up snow removed we can provide safe, reliable snow plowing and snow removal services in a timely manner. We offer either a flat monthly rate retainer or a “pay-per-visit” option during the winter months as our schedule allows. Our schedule can fill up quickly when unpredictable snow hits so it’s often best to engage our services as early as possible to ensure we’re able to service your needs when you need us the most. We provide salting and de-icing services for property owners concerned with the safety and accessibility of their sidewalks and parking areas. If you’d like to schedule a consultation with us to discuss your snow plowing and snow removal needs we’d be happy to meet with you. Please call (913) 422-5111 or fill out our online form and we’ll get right back to you.